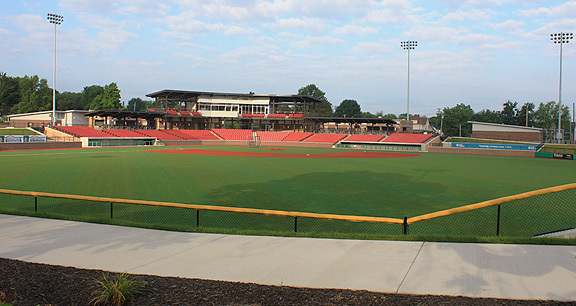 Project obstacles and solutions: As part of the resurgence of its downtown, the City of Kokomo, Indiana built Municipal Stadium, a baseball venue that is home to the Kokomo Jackrabbits of the College Summer Prospect League. Meyer Najem was the general contractor for the stadium. The site for the stadium sits along Wildcat Creek and is in a flood zone. A water mitigation plan was drawn up for the stadium. This included pervious concrete pavement in low area sidewalks. This allowed storm water to filter through the sidewalks as it was channeled away from the baseball field. IMI supplied 40 yards of imix Eco Pave pervious concrete for these low areas. Pervious concrete acts as a pollution filter, trapping contaminants in the slab where they are naturally broken down. The water entering the ground or being channeled back into the creek is cleaner than rain water falling from the sky. The stadium was on a tight deadline to be finished in time for the baseball season. Construction delays due to a legal battles between the City of Kokomo, state and federal agencies put the project 5-6 weeks behind schedule. IMI worked with the contractors to catch up and get the facility operational for opening day. Midwest Form Constructors built the outfield walls, the grandstand and dugouts of the structure. IMI supplied 3,500 yards for the stadium structure. E&B Paving produced the curbs, walkways and the pervious sidewalks. Winco poured parts of the grandstand area. Despite the setbacks, Municipal Stadium was able to open on time to a sold out audience. Beyond baseball, the stadium was designed to host concerts and local school functions. It is a central piece to the downtown revitalization project. For more information on imix Eco Pave pervious concrete, click here.